Join me on a jungle walk | Where to next? We had two walks—one in the morning and one at night—in the Amazon headwaters as part of our stay at Arajuno Jungle Lodge. 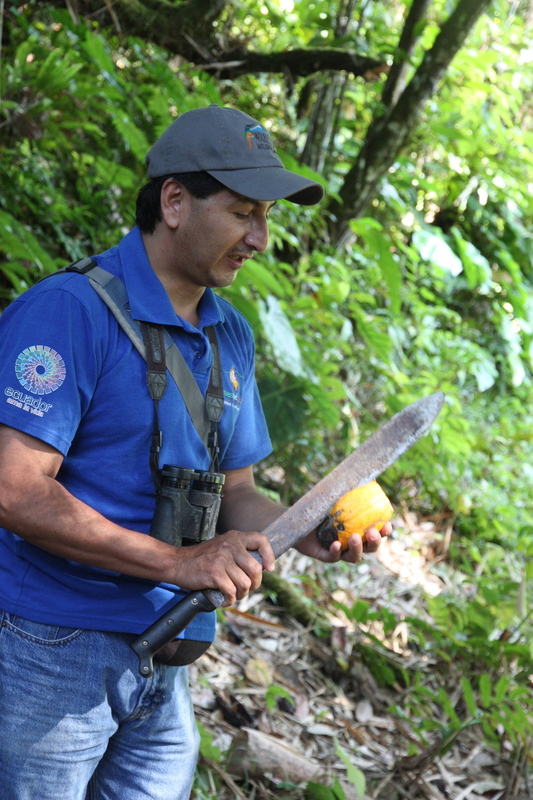 William, who has worked many years in forestry in the Amazon headwater, guided us for the daylight walk. I loved the way he said we’d walk uphill for ‘a bit’, and then on level ground for ‘a bit’ and then downhill ‘a bit’. As I struggled up and/or down yet another vertical slope, I prayed that I wouldn’t do a version of the splits and tear the backside of my trousers or undies. By clinging to my walking stick, any branches I could reach and Poor John when he stood still for long enough, I managed to stay upright for the entire 3-hour jaunt. But seriously, it was fascinating. William really knows his stuff and makes the jungle come alive. Mind you, the bugs and other critters do their bit to make the forest throb. He took us through both primary and secondary forest—the differences being aspects such as the size of the plants (primary forest is bigger and older), the amount of undergrowth and such. We learned about plants that throw seeds once in a life time, the secret life of certain ants (they’re brewing for a big change come the full moon), plants that ‘walk’, what the inside of cacao pod looks like, and much more. As usual, I took way too many photos. Some can’t be shared. It’s hard to capture a bustling ant trail or a web filled with tiny spiders. But I hope you enjoy this selection. P.S. There are no photos from the night walk led by our host, Tom Larson, of Arajuno Jungle Lodge. Too dark! What an interesting walk! How were your calves and quads afterwards? Three hours seems like a long time. I’m really pleased you’re having such a good time. My legs do okay, but I worry about falling. Can’t afford to break anything when you’re on an overland truck! In to the Amazon « Where to next?